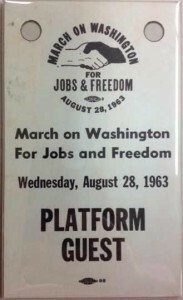 On August 28, 1963 approximately 200,000 people gathered for the March on Washington for Jobs and Freedom. The Ralph J. Bunche Papers include souvenirs from his participation in this historic event. Bunche was a UCLA graduate and the first African American to win the Nobel Peace Prize, which he received for his negotiation of the 1949 Armistice Agreements between the new state of Israel, and Egypt, Lebanon, Syria, and Jordan. He spent the majority of his career working for the United Nations, and was also involved in the Civil Rights movement in America. Even though he frequently suffered from ill health, Bunche insisted on taking part in rallies and marches when he could.